Eurasian Economic Union (formerly Customs Union) is a union between Russia, Belarus, Kazakhstan, Armenia and Kirghizstan. In the past the evaluation of conformity was carried out basing on the national standards of the states members of the Customs Union: Certificate of conformity GOST R, Certificate of conformity TR, Declaration of conformity GOST R, Declaration of conformity TR for Russia, Certificate of conformity GOST B for Belarus, certificate of conformity GOST K for Kazakhstan. In August 2013 the EAC marking, which proves the conformity of products /equipment in the Eurasian zone, was introduced. EAC is an acronym, which means "Eurasian Conformity". According to the decision about the unique EAC marking of products circulating on the market of states members of the Eurasian Economic Union, EAC confirms that products and equipment having been marked EAC have undergone all the procedures of conformity assessment according to technical regulations of the Eurasian Union (formerly Customs Union) in force and are manufactured according to the requirements stipulated in the regulations. 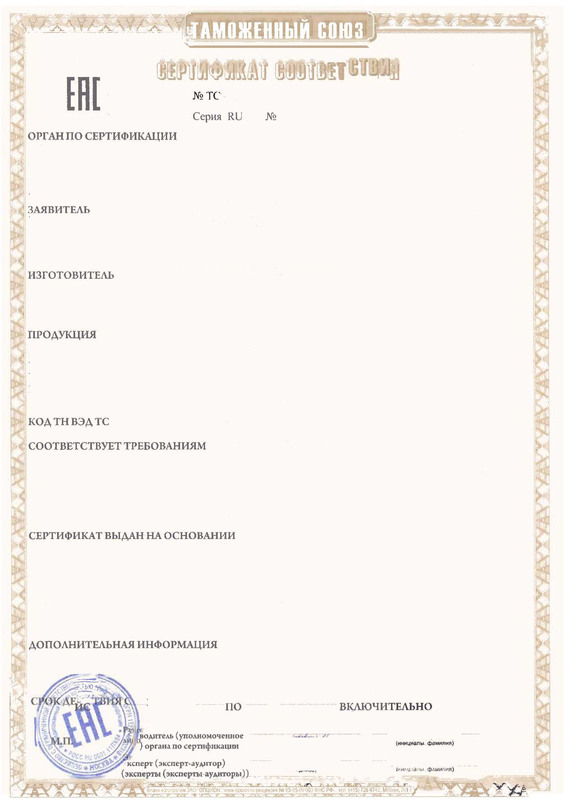 Certificate of conformity of the Eurasian Union is a document, which testifies the conformity of products according to the requirements stipulated in technical regulations of the Eurasian Union (formerly Customs Union). Declaration of conformity of the Eurasian Union is another document, which testifies the conformity of products according to the requirements stipulated in technical regulations of the Eurasian Union (formerly Customs Union). Conformity is assessed in the form of declaration. EAC Declaration or EAC certificate? Group No. 2 for which an EAC declaration is obtained. The classification of products for different groups is defined in technical regulations. 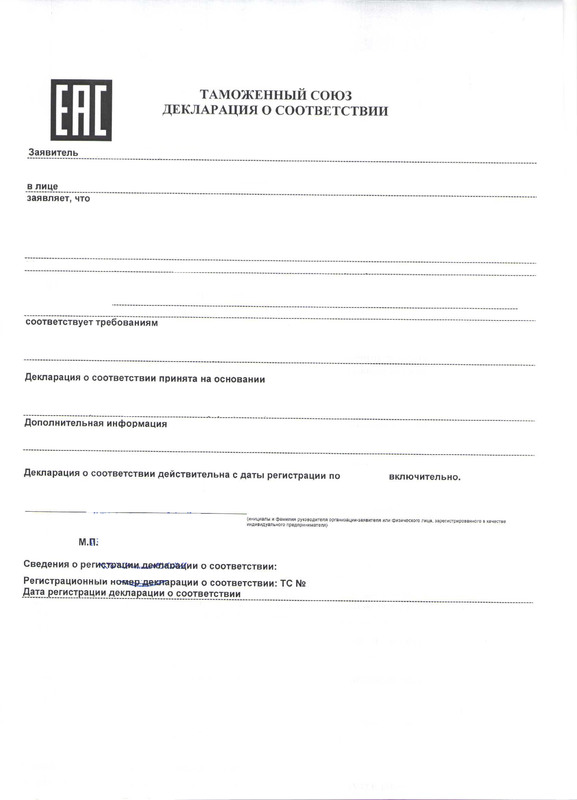 Sometimes it is possible to obtain an ЕАС certificate instead of an EAC declaration (voluntary certification). However, passing from the procedure of certification to the procedure of declaration is not possible. EAC conformity marking is put on vehicles (chassis) for which a vehicle type approval (chassis type approval) has been registered, and for the components of vehicles certified according to CU TR 018/2011. During the marking of components, the single EAC conformity marking is placed on each component or its label or its package. EAC conformity marking is to be placed close to the trademark of the manufacturer (should it be technically possible). conformity marking for the components having signs of approval "E" or "e" is not required. The validity is indicated in technical regulations of the Eurasian Union. The maximum validity period is 5 ans. You can find a list of products / equipment / installations for which a conformity assessment document according to technical regulations of the Eurasian Union can be obtained on our website. In our e-shop you can buy texts in English and/or in French of technical regulations of the Eurasian Union with comments of the experts of CCIS-Expertise. elaborating technical specifications for voluntary certification.